Imagine this: The government announces that all unleaded gasoline will become illegal on January 1st, 2020. What do you do? You own 4 vehicles: a 1995 Honda Civic for your teenage child, a 2000 Ford F-150 that you only use occasionally, your spouse drives a 2005 Suburban, & you just bought a brand-new 2017 Cadillac last week. They all use unleaded gasoline. What do you do? You know that unleaded gasoline is the most commonly-used fuel in the country, & that the price per gallon will rise & rise for the next few years. Do you trade in all of your vehicles today for means of transportation that use alternative gases? Your neighbor is a mechanic, & he tells you that he can convert your cars to run on diesel. Do you trust him? Will that mess up your warranty on your new Caddy? I know this seems like a far-fetched scenario, but this is *sort of* what is happening in the HVAC industry. Let me clear up a few things as best as I can. Without getting too technical, all mechanical HVAC systems use some type of refrigerant. You may have heard this referred to as “gas”, or “Freon”. This is what’s being referenced if you hear that your unit having a leak, or the unit has lost its “charge”. Simply put: equate the refrigerant in your air conditioner to gas in your car: the unit can’t run without gas. R-22 has been the most widely-consumed refrigerant for central air conditioners & heat pumps for YEARS. In 2014, the EPA announced the final phase-down of both production & importation of R-22 into the United States. Starting January 1st, 2020, it will be illegal for new R-22 to be made/brought into the country. You can get some good information in this year-old article here . Not to put you to sleep or patronize you, but suffice it to say this graph is an accurate depiction of what’s going on. Hashtag economics, am I right? Layman’s terms: As we advance closer & closer to 2020, there will be less & less R-22 available for service providers to purchase. What is available to buy will skyrocket in price, & take longer to get in stock. As a rule of thumb, if your unit was installed before 2010, chances are it uses R-22. It’s not a stone-cold lock, but if you look at your unit, it normally will say on the sticker what type of refrigerant it uses. (If your sticker is too worn off to see, it has R-22). We’ve seen units installed as late as 2013 have R-22, however. Ouch. While it may not be as painful on homeowners, who typically have 1 small residential unit, the commercial clients we work with can have well over 100 units, & large ones at that. 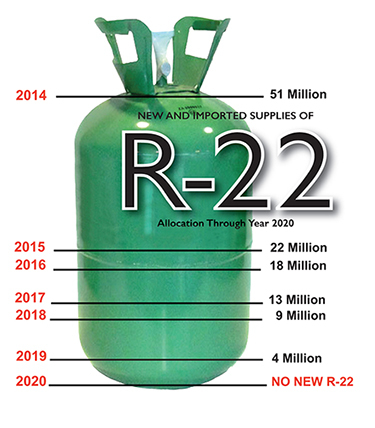 It’s not as simple as spend a little money, & boom: No more R-22. How do you change 50 units in 3 years? Are there other options? Which ones should get a higher priority? This is where we can help. It is possible that with some large commercial HVAC units, the equipment may can be retrofitted to accept a new refrigerant. This is a challenging task, & only a small percentage of units need to even be attempted. Why would this even be attempted? Well, if you bought 10 new, large HVAC units 5 years ago that use R-22 (ouch), you could reasonably hope to get 10+ more years out of those units. So, it may be more cost-efficient to attempt a retrofit, & save the unit itself. Believe me when I tell you this process is truly case-by-case. It’s similar to the car situation above: visualize attempting to convert your vehicle to diesel fuel. That’s risky! You better not use just anybody, but someone very reliable. Even then, your car was built to run on unleaded gasoline only. Trying to run on diesel may or may not work, no matter what. Here’s the bottom line: If your commercial HVAC service provider hasn’t already been making you aware of the state of R-22, you should ask them. Better yet, get a service provider that will keep you informed proactively. Hmm, I can think of one now… Let Gibbs Service Company help you formulate a game plan over the next few years. The last thing you want to have happen is 50% of your units using R-22 in 2020. You then run the risk of spending a huge lump sum of capital that you didn’t budget for to replace the units. Or, if your units still need R-22 & you have a leak, your service company may tell you R-22 is not be available. Just think how happy everyone would be if you had to spend all that money AND it took 1-3 months to get all of the units in stock! It’s June, 100 degrees, & ½ of your air conditioning won’t be functional until August. Don’t let that happen. Let us help you. What are some of the factors that go into a HVAC service agreement? Why do we stay together for the kids?